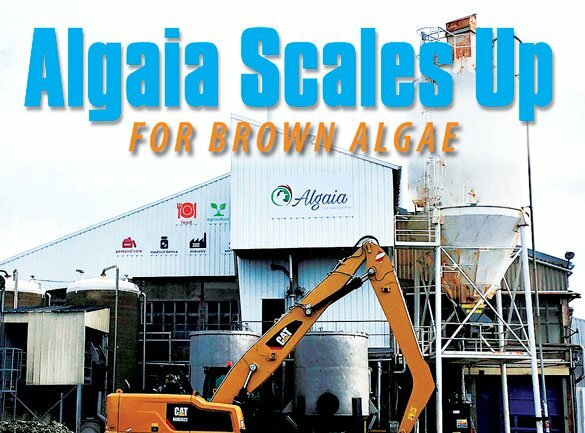 French brown algae harvester Algaia has received €5 million in funding in the last year to develop new marine ingredients, improve processing, and increase capacity. oodbev.com reports that French marine ingredients company Algaia will install a new specialty seaweed extract unit at its facility in Brittany, France, after securing €4 million in funding from its main shareholder, Maabarot Products. Algaia works with local fishermen to harvest brown algae just a few kilometers from the site in the town of Lannilis to ensure a constant fresh supply of seaweed biomass. The Lannilis facility, which was bought from Cargill in 2016, has received €5 million in funding in the last year to develop new marine ingredients, improve processing, and increase capacity. Algaia said it intends to install a new specialty algae extract production line based on innovative technology developed in the past three years. The new production unit will expand Algaia’s portfolio beyond traditional seaweed extracts, adding functional liquid products for the ag-tech market. “We are expanding both our portfolio and our geographical presence,” said Fabrice Bohin, Algaia CEO. “Innovative products and technologies are currently being developed for launch in the coming months. We also are strengthening our positions in the Americas where, as in Europe, we identified a growing interest in marine-derived ingredients. “We are pleased to see our shareholders committed to Algaia’s growth plans and we look forward to continuing our growth both organically and via acquisition of specialty marine-based companies,” he said. Founded in 1963, Maabarot is a provider of health and nutrition products for the dietary supplement, functional food and beverage, and pet food markets.